"Here it is, in all its glory. Portland, the first percussion synthesizer from FSS. Come jam with it at @MachinaBris #TOMORROW!" The Portland percussion synthesizer has been designed as a drum complement to the Brunswick synthesizer. Like the Brunswick, Portland has been designed with affordability and flexibility in mind, allowing for the ultimate performance from relatively basic electronics. 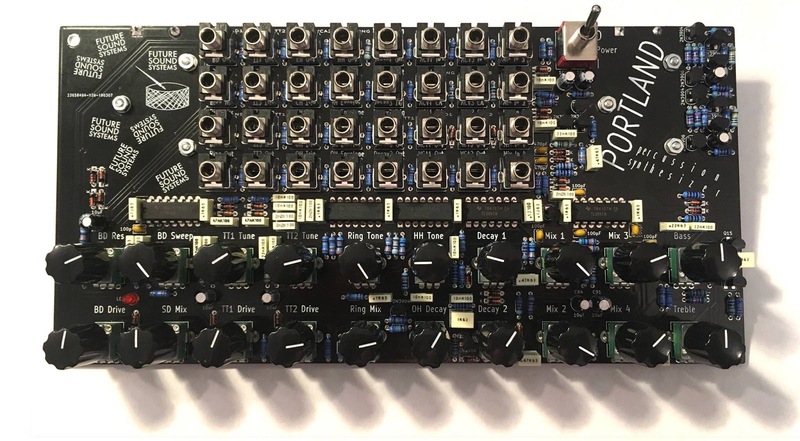 Portland is also presented as a "sandbox" for percussion and drum synthesis, giving several different analogue sound generation and shaping elements in a patchable unit. The elements are normalled together on the patchbay, allowing for minimal patching to arrive at a kit of drum sounds, but this normalling can be overridden for more complex drum sound synthesis. A signal flow diagram of Portland can be seen here. Whilst Portland can be powered from two PP3 9V batteries, the forthcoming FSS Battery Simulator will allow Portland to be powered from DC or Eurorack power supplies. Portland is also fully compatible with modular synthesizers and standalone sequencers. A Eurorack panel for Portland will be available soon. Limited quantities of assembled units are available to purchase direct from FSS. Full kits of the Portland percussion synthesizer will be available from Thonk, May 2019.